The job of a police officer is no joke; when dealing with a deranged man with a gun like this, it’s even harder. This has lots of lessons for CCW and LEO alike for our Active Self Protection! If you value what we do at ASP, would you consider becoming an ASP Patron Member to support the work it takes to make the narrated videos like this police involved gun fight? https://get-asp.com/patron gives the details. 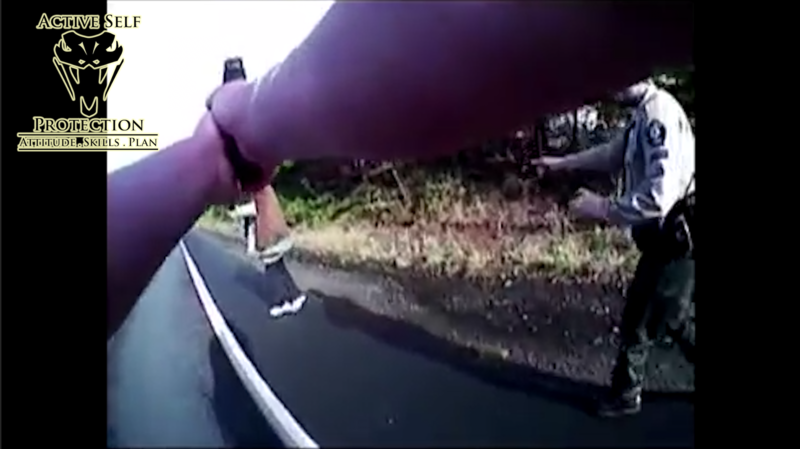 What does this badge cam video teach us about the realities of using a gun in a deadly force encounter, whether you’re police or CCW? Having a light mounted on your gun is not for everyone, but for those who can make it work it does give you another tool in the toolbox. I carry the TLR-1 HL on my every day carry gun and it works wonderfully. It does not replace a handheld light for general lighting needs, but for illuminating a known threat it is very helpful. The key, as always, is to train with it regularly and seriously. These police officers ALL needed white light on their gun to illuminate a threat, even in the daytime. That’s a great reason to always have a light on you! Sometimes the danger that you must protect yourself and your family from isn’t evil, but is rather deranged. People who aren’t in their right faculties can be a real danger to your family, even if they are not inherently evil. You need the attitude, skills, and plan to protect yourself from evil AND from non-evil threats that pop up! The police here were serving a warrant for a stolen gun, but the man clearly wanted to commit suicide by cop and that’s why he brought a gun to the door. Part of your training must be knowing when to use verbal commands, and when to abandon verbal commands and move to physical or deadly force. Many times self-defenders (and LEO) get caught in a loop of issuing the same command repeatedly to no effect. Using verbal commands is an important part of your force options training, and part of that training in verbal commands is knowing when to talk and when to stop talking and act. 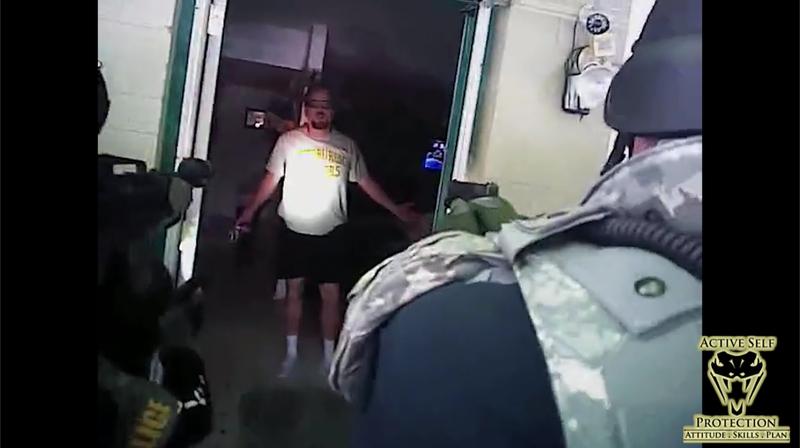 The officer in the badge cam here knew that they had to do something else to get the gun away from this man, and so he went for the TASER. First aid skills are important. If you’re going to train and prepare to take a life to defend yourself with a gun or knife or what have you, you should also have skills, training, and equipment to save life should you need to. (I carry an individual first aid kit at a minimum: http://amzn.to/1Or4yVz ) Often that will not involve defensive encounters, and in a defensive encounter your primary responsibility is to yourself and your loved ones. Notice that every police officer had a first aid kit on his vest in this video! Your reaction speed will not be faster than .2-.25 seconds from stimulus, at the very fastest. Therefore, if you’re facing someone with a gun, recognize that even if their gun is at their side, they can raise and fire it before you can react to their action and shoot them! This is an important consideration for firearms carriers, and the principle is a simple one: action beats reaction. When facing an attacker, recognize that you will not be able to react in time to stop them from shooting you if they have a gun in their hand and choose to use it. The police officers were on their sights and triggers, and this guy got two shots out of his gun before they stopped him! Would you have taken the route that this guard took? Would your other skills have come to the front, or would you shoot him as well? These kinds of encounters are why we post after action reports on Active Self Protection! If your awareness is solid, you should get plenty of pre-attack cues from a robber or other attack like this patient. If you’re know what you’re looking for it becomes a lot easier to see who is out of place! Watch for furtive glances which are an indicator that they are looking for potential witnesses to their actions or escape routes after the attack. Check hands as well to see if they have anything in them or are hiding unnaturally in pockets, or clenching as this patient was. If you see a pattern that makes you uncomfortable, move from condition yellow to condition orange and take action to investigate or move to safety. The eyes may be the windows to the soul, but the hands are the windows to the intent of a person. If you’re in a potential conflict, ALWAYS pay attention to what the aggressor is doing with their hands. The guard knew an attack was coming because of the hands! They might have a force multiplier in their hand, or they might be hiding their hand so that you can’t see what is in it or using their hand to conceal something. If their hands are empty, there is a difference between someone with fists and someone whose hands are open and relaxed. As a self-defender your situational awareness must include seeing the hands of any potential threat in your vicinity, so watch the hands! To defend against this kind of attack, you need emotional fitness. Emotional fitness is defined as the ability to internally represent a situation or predicament to yourself in such a way as to make you strong and able to successfully defend yourself against it. Repeated practice and thousands of reps of sparring and self-defense absolutely build your emotional fitness to be able to handle whatever comes your way. The guard in this attack needed emotional fitness to stay calm and in the fight until he could get to his force multipliers, not to gas himself out and wear down. It’s not easy, but when you’ve done it on the mat repeatedly it becomes second nature. If you have a partner with you when you’re attacked (be it a LEO partner if you work on a team, or your spouse or martial artist buddy), you want to do everything you can to work as a team. The guard and the other man didn’t seem to work together very much, and knowing how to communicate and work as a team is the key to winning if you have a partner! Communicating clearly will help you protect yourself from danger. This takes training and practice and commitment, but two partners working together present a formidable challenge to any attacker. Fights are physically demanding, and this guard certainly felt the physical toll of the fight. Sure, a pure gunfight might last 10 seconds and not place a huge burden on you physically, but the vast majority of encounters we see here at ASP involve physical self-defense as well. Getting into a honest-to-goodness fight with someone is incredibly physically demanding, so being physically fit is an important part of maximizing your chances to protect yourself. Fit people are harder to beat and harder to kill! Even in a gunfight, empty-handed skills are important because many gunfights close to “extreme close quarters” or “bad breath distances.” Knowing how to protect your firearm from being taken, and how to win the fight that you’re actually in rather than the fight you want to be in, is crucial. If you’ve never fought from the clinch with your gun in the fight, on the ground and on your feet, your training has a huge gap in it. This guard really needed empty-handed skills and close quarters fighting skills. You must be able to fight and defend yourself from all different stages of action. One of my martial arts mentors, Skip Hancock, likes to say that we must be able to fight wherever the fight happens to be! So whether we are at contact stage (just able to come in physical contact with our attacker), penetration stage (where attacks can contact and penetrate significantly), or manipulation stage (a clinch or similar where joint and body manipulations are possible), we must be able to use effective technique to protect ourselves. 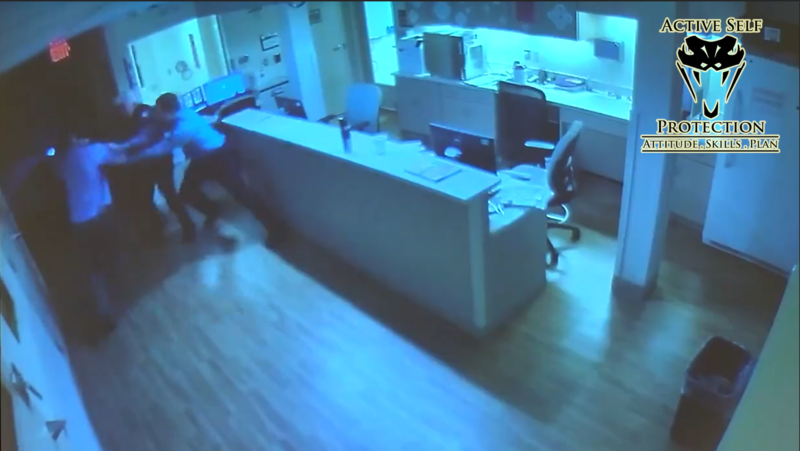 The guard had a hard time with defending his firearm and employing his TASER.